Problem 1. A car covers the 1st half of the distance between two places at a speed of 40 km/hr and the 2nd half at 60 km/hr what is the average speed of the car ? Problem 2. 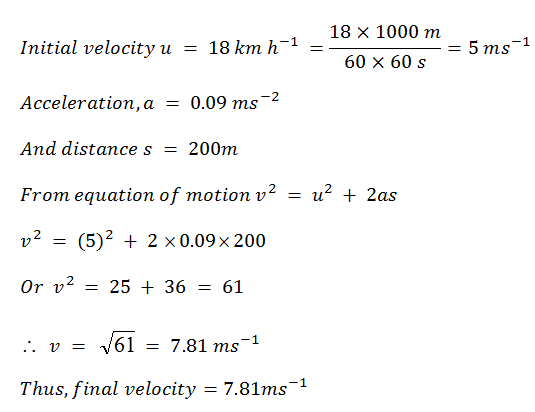 An object moving to the right has a decrease in velocity from 5.0 m/s to 1.0 m/s in 2.0 s. What is the average acceleration ? What does your result mean ? 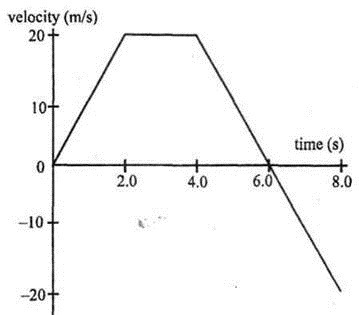 The negative sign means the acceleration is opposite to velocity (deceleration). The result means that the object decreases its velocity by 2.0 m/s every s or 2.0 m/s2. Problem 3. The table below shows the distance in cm, travelled by the objects A, B and C during each second. (i) Which object is moving with constant speed ? Give a reason for your answer. (ii) Which object is moving with a constant acceleration ? Give a reason. 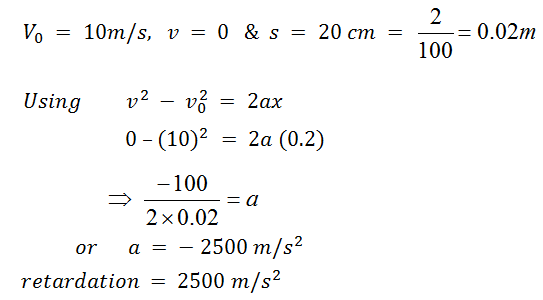 (iii) Which object is moving with irregular acceleration ? The object C is moving with a constant acceleration. The reason is that for the object C, the distance covered increases by the same amount in each second. It can further be verified by drawing graph between S (total distance covered) and t2 (square of time taken). The graph will be a straight line. The object B is moving with irregular acceleration. Question 4. An automobile accelerates uniformly from rest to 25 m/s while traveling 100m. What is the acceleration of the automobile ? Given: v0 = 0 (rest), v = 25m/s, x = 100m. Find a. Since a is positive, it is in the direction of the velocity or motion. 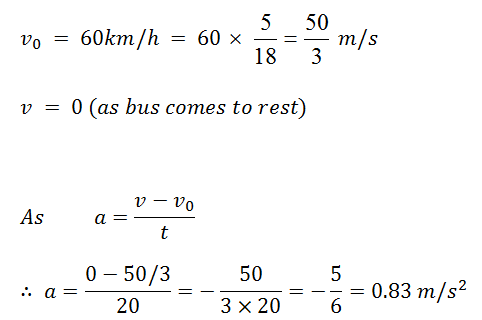 Problem 5. car is moving at a speed 50 km/h. Two seconds there after it is moving at 60 km/h. Calculate the acceleration of the car. Problem 6. A bus moving with a velocity of 60 km/h is brought to rest in 20 seconds by applying brakes. Find its acceleration. Problem 7. A bullet moving with 10 m/s hits the wooden plank the bullet is stopped when it penetrates the plank 20 cm. deep, calculate retardation of the bullet. Problem 9. The graph represents the velocity of a particle as a function of time. (a) What is the acceleration at 1.0 s ? 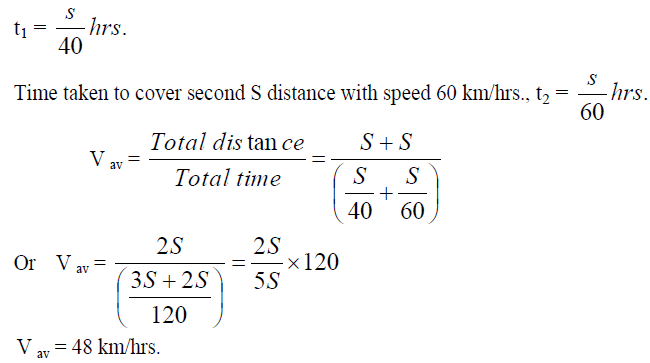 (b) What is the acceleration at 3.0 s ? (c) What is the average acceleration between 0 and 5.0 s ? (d) What is the average acceleration for the 8.0 s interval ? 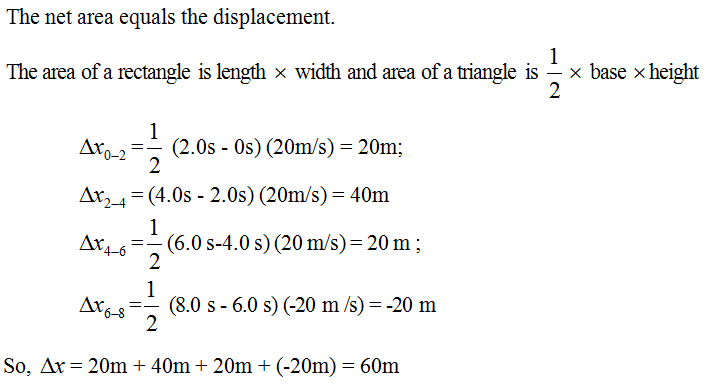 (e) What is the displacement for the 8.0 s interval ? The slope of the line is zero and a = 0.